This post is sponsored by Immaculate Baking Co. but the recipes, content and opinions expressed here are my own. I am about to show you two of my go-to holiday appetizers and they couldn’t be simpler. 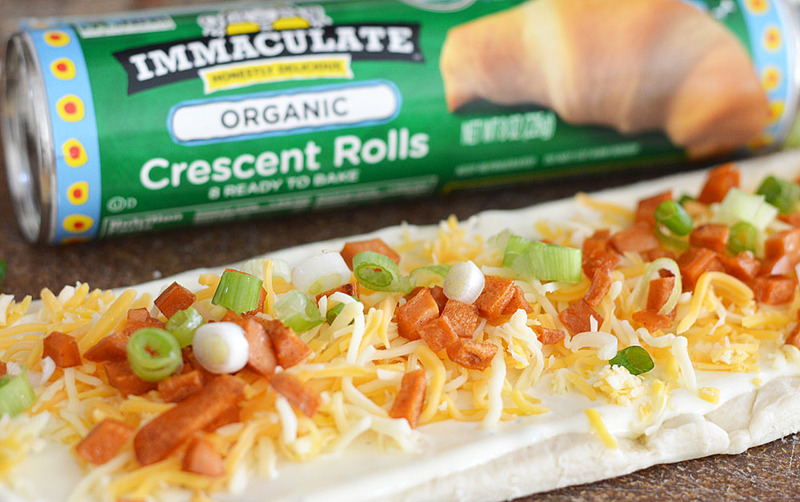 I’m using Immaculate Baking Company’s Organic Crescent Rolls to create both of them. This company makes a whole bunch of certified organic, gluten free, and non-gmo products and they have a great story to boot! 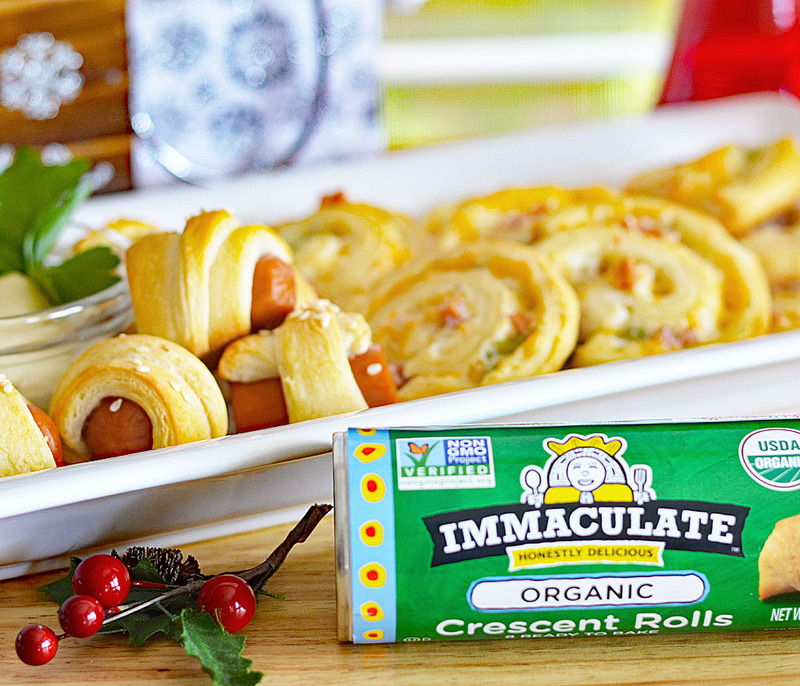 Before we get started, I want to be sure you go and grab a coupon here which will give you $1.00 off of any Immaculate Baking product! 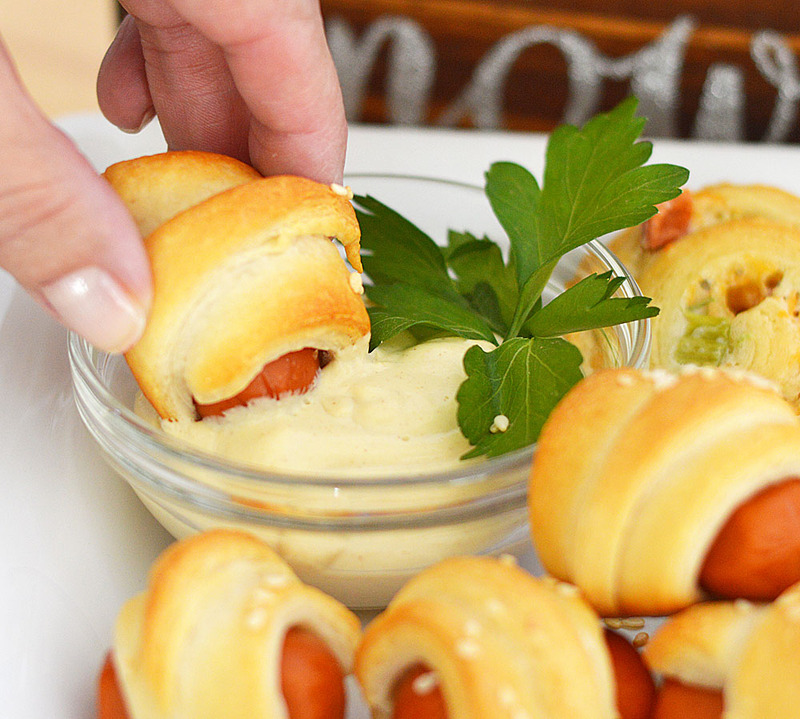 The first recipe are these Mini Crescent Dogs topped with a sprinkling of white sesame seeds. I also made a dipping sauce which is just vegan sour cream and Dijon mustard whisked together and warmed. You could also use straight yellow mustard if you prefer. 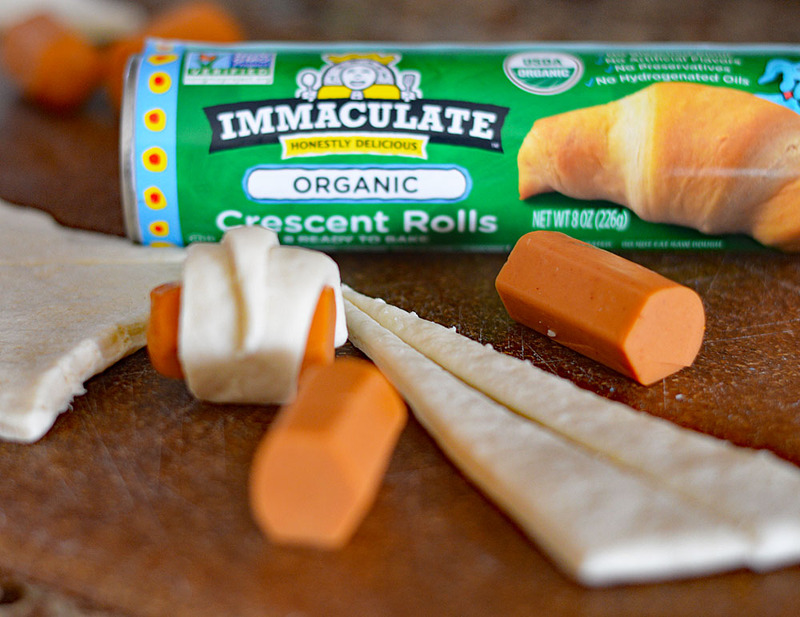 When you unroll the Immaculate Baking Organic Crescent Rolls, you’ll have two squares, each scored into triangles. You’ll take each triangle and cut it into thirds. Each triangular strip gets wrapped around slices of veggies dogs. I cut my veggie dogs into thirds as well. 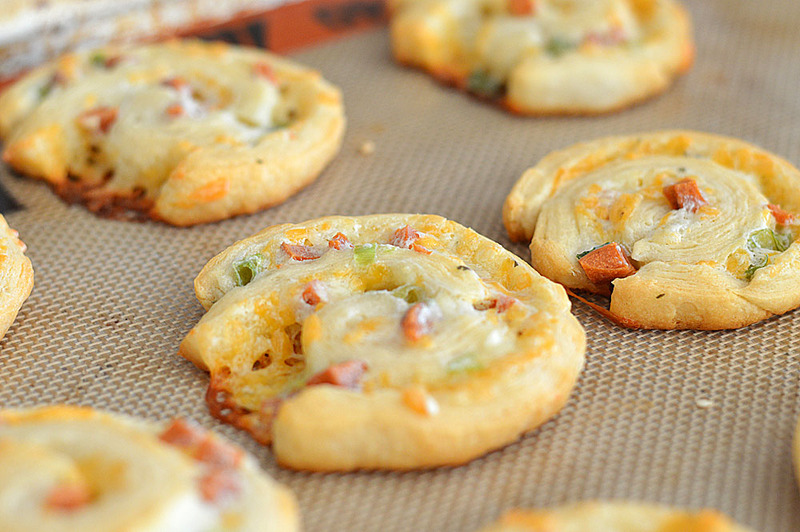 If you want to get fancy, you could also put cheese inside prior to rolling. I would use slices I think to make rolling a bit simpler. 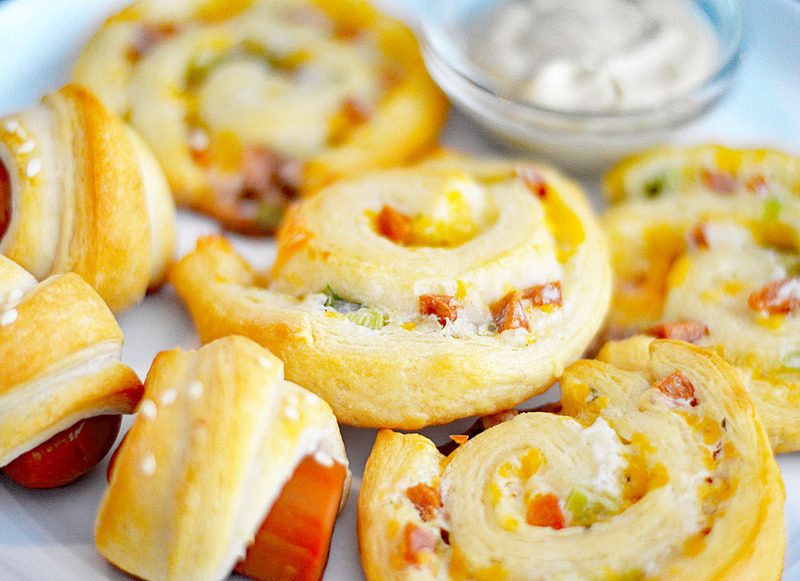 And these, my friends, are Cheesy Ranch Crescent Pinwheels. These are MY personal favorite. Be sure to have some extra ranch dressing around for dipping! I simply unroll two rectangles from the container (so that’s four triangles of the dough) and press the seams together securely. A layer of ranch dressing topped with shredded cheese, our crispy diced veggie dog and finally, green onions. Just take the short end of the dough and roll. 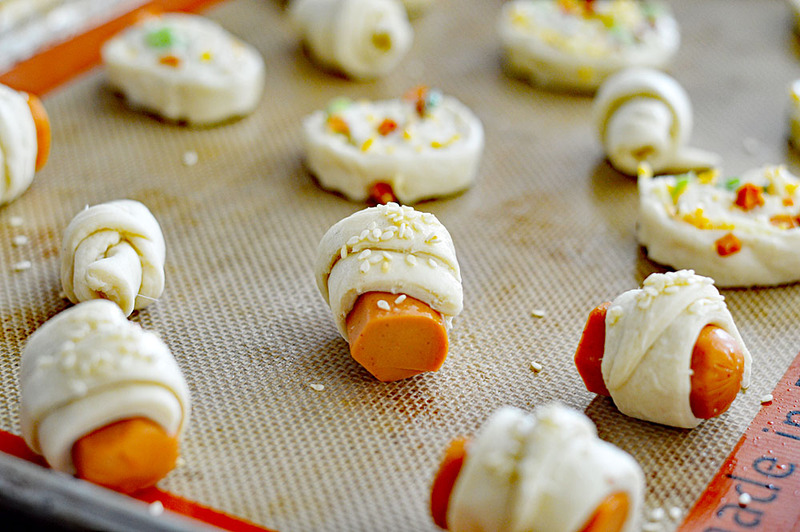 With a sharp knife, create slices and place onto a lined baking sheet with the Mini Crescent Dogs. Bake at 375 degrees for about 15-17 minutes or until golden. Allow to cool on the baking sheet before transferring to a serving plate. I create a bunch of these little individual glass bowls of dipping sauces so guests can help themselves. 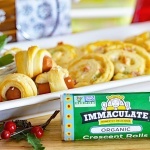 Be sure to click here for $1.00 off of any Immaculate Baking product! Unroll the crescent dough from the can and take four triangles, cut EACH triangle in three smaller triangles. Slice an uncooked veggie dog into thirds, place one third onto each triangle you created above and roll. Using a butter flavored spray, top each rolled crescent with a sprinkling of white sesame seeds. This is, of course, optional. Whisk together the heavy cream/sour cream and Dijon mustard, heating over low heat in a small saucepan just prior to serving. 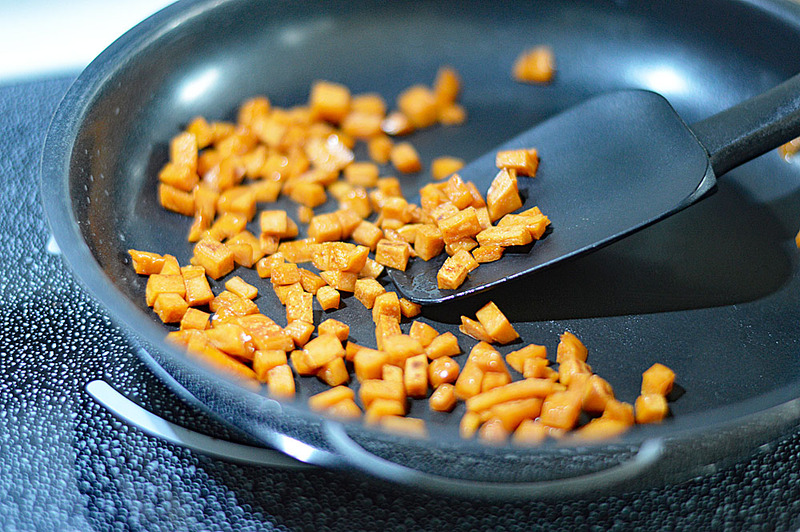 In a small non-stick pan and a tiny bit of oil, add the diced veggie dog and fry until crisp. Using the other 4 triangles from your crescent tube, press all of the seams together creating a "sheet" of dough. Spread ranch dressing, followed by shredded cheese, the crispy diced veggie dog and finally, green onions. Take the short side and roll. Slice the roll into about 8-10 portions and place onto the baking sheet with the crescent dogs. Bake at 375 degrees or until puffed and golden. Serve with extra ranch dressing on the side for dipping.